Plant Those Bulbs, Ho Ho Ho! A little work now creates a wonderful surprise in the spring! Get a cup of hot chocolate! 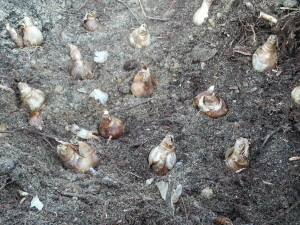 Planting in a big hole provides the opportunity to create a bouquet of flowers (here I have a dozen daffodils). The bulbs are placed about 2-4" apart, at least 6” below ground. Twelve little daffodils tucked warm in their bed. It is a big hole to dig when it is so cold, but having help (like my husband, Matt) speeds the process along and makes the chore easier. Sprinkling some bone meal around your planted bulbs will give them a little food in the spring when they awaken from their long winter nap. Then cover completely with soil and tamp down. A little help makes the job go faster! It can be fun to find new places to plant your spring bulbs. Spots in the garden behind other perennials or shrubs gives daffodils and tulips the opportunity to shine before the other plants fill out and helps mask the bulb foliage while it ripens. It's fun to squeeze in more bulbs in early winter. Next spring they will raise their pretty heads and fill the garden with color. Maybe we can call them LATE presents from Santa!